HoverWatch review: only real information from its users. Try it for free! Posted on December 27, 2017 by Tom Richardson Posted in Cell phone & Computer Monitoring Reviews . Top quality services, the newest options for tracking, demo mode, and various packages for the users – HoverWatch makes spying available for everyone. Perhaps each person in this world dreams to reveal some of the secrets which help settle some of the problems and take some of the decisions. HoverWatch is one of the best and fast developing spy applications. It’s perfect for the remote control of the target devices in case if you feel like you’re cheated on. Applications like these are not considered to be legal and you can use them on your personal responsibility. Let’s have a brief review of the app’s functionality. Right after the recording all calls are downloaded into your personal HoverWatch account where you can listen to them whenever you want. The information and data saved in your control panel will help you know the date, time and duration of the conversation; the recording itself; the geographical position of the call; the name of the conversation partner in case if it’s recorded in the address book. This feature is perfect for the control of your kids’ activity if you supply them with a basic phone to be able to contact them through on your working weekdays. It works in case if Geo location and Wi-Fi is turned on the target device. Besides, the location of the desired device can be tracked with the help of GSM. Use your personalized HoverWatch account to get info about the location of the device you’re willing to track. The location of the phone will be marked directly on the map so that you can zoom and follow it. You’ll be able to track both incoming and outcoming messages as well as conversations in instant messengers like Viber, WhatsApp, Facebook and others. It’s not only about texting, but you’ll also manage to browse the sent and received pictures, photos, voice records and other data sent through the messenger. It’s been almost impossible to track Snapchat for a very long period of time. Snapchat is regularly used by people trying hard to conceal their private lives. The trouble is that messages and data sent through Snapchat appear on the screen for a very short period of time not to let anyone discover it except for the owner of the device. However, the multifunctional mobile tracking applications of today are able to run in the background and create a full log of Snapchat activity in your account. It’s the same with HoverWatch. All data is quietly saved for you to read it. You can easily make screenshots from the target device whenever you want it. The screenshots you make remotely are kept in your HoverWatch account for a period of thirty days. Screenshots can be received from Android mobile devices. This function allows you to get a photo from the target device front camera on the screen unlock. It works on Android mobile devices. It can be extremely helpful if the target device is lost and you need to find out who owns it at present. All contacts and calendar notes from the target device are saved in your HoverWatch account regularly. You’ll know everything including appointments and plans. The list of websites browsed from the target mobile device is saved into HoverWatch control panel. You’ll be aware of all search entries. You won’t have to root the target device to use this function. Note: You can track up to five devices at once. HoverWatch gives you a set of basic tracking features. This application is still in the process of the development and improvement, so new features are going to be added through the time. Remember, that when you use HoverWatch to track someone’s activity on the mobile device, you bear all responsibility for your actions. Spying is still considered to be illegal. It is only legal when you use spy applications to track the devices belonging to you or to your kids. In other cases, you should be aware that a person’s privacy is protected by the state law and you have no right to break it. All the common problems, issues, and questions which may appear during the usage of the device, are clearly analyzed and explained at the FAQ section of the website. If some of the problems remain unsolved, use the Submit request field to contact the support team. HoverWatch provides users with the developer set of the packages and pricing for the services. A person uses HoverWatch absolutely for FREE for the first week. And only when you have tested it, you buy it later. However as you can see the prices are not so high for such a wonderful spying app, which has all important tracking features. You get automatically unsubscribed seven days after your previous subscription runs out. All monitoring logs are deleted as well. A monthly subscription runs for thirty days sharp. You can pay using any method convenient for you. If you need a specific payment method, contact the official HoverWatch support directly. HoverWatch can be used with the devices running on Android / Windows PC / Mac Computer. Other devices do not match the requirements of the application, so be sure you avoid to install it. In case you install software at incompatible devices, the developer cannot guarantee the correct working of the app. Remember, that you’ll have to root the target device before you’re able to track it. Without rooting, you’ll only get a set of basic functions – HoverWatch will be highly suppressed. The refund is available. You have 7 days to return your money. To know the details, contact the support team of the HoverWatch in case you want your money back. once a device is added and your trial or membership expires, must you go through the whole process of re downloading the app back on the target phone? If your free membership expires, usually an e-mail is sent to you with the prolongation suggestion. In case you can not find such one, please contact their support. The software runs hidden on the monitored device. If you have any further questions, you may ask HoverWatch support. Have you tried to contact HoverWatch support team? HoverWatch makes possible WhatsApp tracking only on ROOTED Android device, make sure that the target device you want to monitor is Android and it is rooted. Check here at the bottom of the page Android installation guide. In case you still can not fix your case, please contact their support team. Then there is a trial period? proof? How to uninstall this app on my android phone? In case if someone reset the target phone. .what will happen? In case a factory reset was done on a target phone and all passwords were changed after that, a spyware will be automatically deactivated. hi this software is compatible to ios 9.3.2? and all call is recorded? Call recording is possible with HoverWatch however it works only on Android phones. The app is not compatible with iPhones, but you can use it to track Mac. will deleted message from the phone still show on the logs? HoverWatch allows you to track all received and sent messages. You can spy on deleted messages only in case the spyware had been installed on the target device before the message was deleted. Check also the review of the spyware, we recommend, while many our visitors have chosen it. Is this also able to log all keystrokes? Like texts that have been entered at a website? If yes, is a root required for that? You can track all keystrokes and browsing history with a cell phone spyware, only if a person uses an incognito tab then spying is not available. It does not require rooting, you can check more detailed information here: “The application will quit and Hoverwatch will start recording in the background. If your phone has not been rooted, you’re all set. Richard, how does one view the keystrokes because I have not figured that one out as yet. Do tell. Also, on older phones, it is possible to view websites (screenshots) in incognito mode but not the newer devices. mSpy software allows you to spy on online activities, even if a user used incognito mode – https://phonespyapps.com/tracking-on-browsers-incognito. As for keylogger option, both HoverWatch and mSpy allows you to see everything which was dialed on the target phone. We recommend you to contact HoverWatch support, they should help you with this issue. We are site-review, which is created to help people to find the best tracker for their needs. And according to our analysis of different apps and customers’ preferences we recommend Top 5 best spying applications. They are not free, however you will not have such issues with them like with HoverWatch. Moreover some of them have free trial versions. Let me know if I can help you with anything else. How do you contact customer service to speak with someone? Here is the contact form. This is the only way to contact their support team. Let us know if you need any further help. And let us remind you that we recommend mSpy Software as the best app according to our readers’ choice. If someone has Hoverwatch on their phone can that person get on websites or things without the spy app knowing? If they dud something intensionally so it wouldn’t know? Where the hell do i write pin code?? I pay for Hoverwatch, and all of a sudden today nothing wants to update. It keeps showing the target phones last connected times but doesn’t show unlock photo, calls, text, nothing. This is ridiculous!!! Why isn’t there a clear instruction on how to uninstall Hoverwatch from my phone. The trial period us over but I still see Monitor in the running apps. Are they still collecting data from my phone? What functions can I use after trial period (for free)? As soon as your trial period is finished and you want to proceed using the software, you have to pay for it. I have started my own business only 6 months ago, but already understand that to manage my stuff I need some effective tools. Hoverwatch is rather cheap decision for this case. Checking online activities of my employees I can find out when they finished their job and are ready for the new case. Or sometimes reason of using Facebook during working hours is not completed job but only laziness. In this situation only layoff can help. Oh, this is very curious application, and I am extremely interested in its installation. Especially interesting to me, the GPS and geolocation tracing function, and also notification messages about manipulations with a SIM card. I think it the really useful opportunities which will help me in my life. And any of you already used these functions and what your impressions? If my employee brings in the phone to a service detailer to actually see if he/she is being monitored,can they uncover the app or is it completely hidden?and if I stop monitoring,does the app auto delete on the device?how do I get to clear the target phone to make sure this is not uncovered ?? The Hoverwatch app functions completely hidden on the target cell phone. Yes, if you stop your subscribtion the app is automatically deactivated. Here is also the deinstallation instruction for you. Service detailer can not sort out that this is a cell phone spy, however it can show this app as a kind of malware. Thus the monitored person can delete it. If there is an antivirus software on the target monitored device, you should put Hoverwatch to the list of Trusted applications. If you have more question, I will gladly answer to them. Are u supposed to install it on the person you want to spy on’s phone?? Yes, you should install a cell phone tracking software to the phone you want to monitor. As soon as the tracker is on the target device, you can spy on all phone’s activities from your online account. Let us know if you have any further questions. Hi)) I’m interested in Mac tracking, especially in ICQ, Skype and blocking some web-sites. I read that the app is fully compatible with Mac. Is it possible to monitor a laptop’s location if it is connected to the Internet? Does HowerWatch support blocking feature? Moreover, I’m afraid my son will suspect something if he finds out that certain sites cannot open. HoverWatch works on MAC as a keylogger and save the typed texts. It registers all the pressed service keys and saves them just like they were seen by the target device user. Keystrokes interception is enabled by default. You don’t have to change anything in the settings to use it. All the pressed keys and typed texts from the monitored computer that are saved by this free keylogger for Mac can be accessed online through the user panel from any device with Internet connection. You can get quite a detailed picture of user’s activity using the screenshot function as well as keystrokes interception feature. GPS tracking features is not possible for MAC devices, however it works on Android phones. As for Blocking feature, HoverWatch does not have it. It is mSpy software which makes blocking possible on the target device. I’ve installed it on a new galaxy7 edge. It picks up sms conversations. Call info and records the call. Websites visited and I can view them. It takes pictures of the unsuspecting person using the phone. Location on a map and geographical tracking . It does not pick up everything that is typed.ie. no email activity. Their support told me they’re working on it. Silly that they sell the idea that it reads email now when it doesn’t. It is very quick and easier than most to install. You can sign up and get ready with the trial version free, and then download from there straight onto the target phone in 2 minutes. It becomes invisible and starts working. Then you have 3 days trial before you have to pay, or if you don’t, it just stops. Very simple. I go this app and it worked great, until I paid for it! Now I can’t see anything. Nothing is working and I have emailed without a response as to the problem yet, just a we are looking into it. DO NOT WASTE YOUR MONEY! Just curious if your problem was fixed after getting in touch with Hoverwatch technical support team ? If yes, did they ask you to access the target device again .\? I am in a same situation, all of a sudden it stopped working. I hope you have solved the problem. Please check your e-mail for login details. I could not buy this app may you please help me for buy this app. Let us know if you still have problems with that. Does records still load after the trial period ends? I want to pay for the subscription today, but I want to be sure that everything up until today will still be shown before doing so. If everything works fine for you during the trial period, then the app will function after your payment as well. You should understand that in many cases the software does not work in a proper way if the installation instructions were not met or the device is not compatible with the spying software. Hope to see your review on our website after the purchase, we are sure it will be useful for others. Does the app pick up google searches and all websites visited ? I installed it on a target device last night and Im trying it out today – searches something on google but didnt actually click on any of the results – is that supposed to show when I check hoverwatch? Also is there a way to check what was visited in the ingognito mode ? 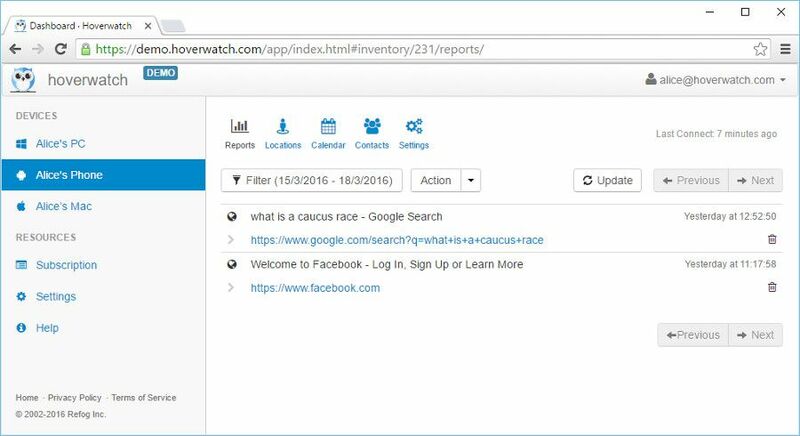 Hoverwatch software saves the information about all the websites visited by the user of the Android-powered target device. The title of web pages visited by the user on the target device is also saved for viewing convenience. This information is stored in the user panel and can be accessed online from any device with Internet connection. As for incognito mode – no, the spying software does not show the results, when a person searched through incognito. Hello again and thank you for your reply ! I installed hoverwatch on the target device about 1 week ago and it has been working perfectly up until yesterday when it suddenly stopped updating the location of the device. Up until them it was updated every 30 mins and the accuracy was amazing. However it hasnt shown any information on location in over 13 hours now. Why could that be ? Its showing everything else as usal – texts,calls ,unlock photos etc ..but no location information? Could the location tracker be somehow deactivated from the target device if the person found out about the tracker being installed on the phone? If you do not remember your login details, try to use the option FORGOT PASSWORD. is it possible to pay $19.95 without log in. For only record the audio call, msg , how much I have to pay par month?? If you buy an app you receive all the features, which are included into the subscription (call recording and messages spying as well). HoverWatch is relatively cheap spyware. You use it for free for one week and after the trial period you have to pay €19.95 per 1 month per device. Check the details here. i created a acount and tryil has expire. how can i renew your supcription to show our child divice call detalil. Please check your e-mail (which you used for registration). The prolongation should be automatically suggested to you. Trying this out on my phone before buying and installing on daughters. No locations updated yet. It has missed groups of sms messages sent. I’m going to continue monitoring for another day but if these missed messages keep happening then it’s useless to me. And I know my location on phone is working. Google has updated my location on it’s site twice since this app was installed. Have you tried to contact HoverWatch support? Also, an export feature would be nice. At least for the call and sms logs. Cell phone tracking apps work anywhere in the world. You should have only access to the internet. It is more important that your target phone should be compatible with the monitoring software. My trial has ended and want see the features and the results but upon logging into the dashboard you are only offered a purchase plan. How do I even see what the product is capable of then. If you have already tested an app for free by using the trial version, you are not able to use it any longer. You should only buy an app to proceed your spying. If you want to get more information simply check HoverWatch page with the tracking features and see how the spyware works. Have you got reply from the customer care department? Are you sure that the target device is conected to the internet? I want to buy but I don’t know how??? I should remind you that if you want to get HoverWatch you should sing up on its website. For this, visit the page https://phonespyapps.com/hoverwatch-review and find two buttons at the end of review: click on VISIT SITE > scroll a little bit down > see the button SIGN UP FREE > put your login details there. Is it possible to uninstall phone remotely? can we grab passwords like in key logger ? The process of rooting is really easy. There are plenty of guidelines in the net, plus there are cool videos on how to do that on Youtube. We advice for rooting the following apps like Towelroot or Kingoroot. Later on we will post a guide on how to root an Android device for your convenience. If you have any troubles, please let us know asap. I paid for the subscription of 3 months and it’s been 12 hours since I made the payment.. The trial version didn’t get updated yet.. Can I know the reason for it..? I did not really get what you mean. Have you signed up for trial but did not get it? Please clarify and we will try to help you. a month after using the 3 day trial i decided to purchase the premium using the same account. after succesfully subcrbing i cannot use the app! it says “there is no subscription” i sent message to the costumer support system. its already day 2 and there is no response! i want the features of this app but m very disppointed and i want a refund now! Please specify what you need. Do you mean a discount? i use this app as free trial its work very good and i like it … now i want to purchase and i belong to pakistan please tell me easy way to pay and purchase this app and kindly inform me may i have to install this software again in mobile of my son??? You can also check your online spying account and prolong your free subscription. The monitored device must be Internet-enabled for spying app to send information from the monitored device to your Control Panel. It uses both Wi-Fi and 3G/4G Internet connections. Once the information is uploaded to our server, it will be displayed in the Control Panel of your account. Again, as read over & over above, everything was working perfectly. Then once I paid for the app, it just stopped. I need to have access to facebook messages etc.. but root required , what are the ways to root the device ,is there any specific tool or just root the device which anytool available ? It is up to you to decide which rooting tool to use. There are many tools available as well as step-by-step guides on how to root the specific phone. Please contact HoverWatch support here about this case. using a motorla droid turbo 2 ……. a motorla device update was done on the phone… now hoverwatch is showing me in the dashboard setting that a “softwareon this device needs to be updated”….. the phone is not rooted.so i don’t have automatic updates…. But at the top of my settings (next to the notification) it has a link to click “Install an Update” If i click on this does it alert/send notification to the phone or take it out of stealth mode?? Does this work on a iphone? HoverWatch runs only on Android, Mac and Windows PC. I love this app but how do I know what passwords she is using. I trust her but want the security of my child’s passwords. You have to perform a factory reset on your phone. We highly recommend you to contact HoverWatch support team. my trail version is up and i remove this app from my phone and i missing the uninstall pin please sugest can i remove the hoverwatch app….. I am a regular user of this spyware. My subscription is over for 10 day as of today but from the 5th day of expiration and it is not renewed, please help me how to renew, I have purchased twice for one month but I failed to log in as it shows subscription expired. Hi i cant see anything anymore does that mean it was uninstalled on other device? Please provide us with more detailed information. Have you installed a trial version? Or have you already bought the app? Did it give you the monitored information in your account? For how long, etc? I had using this app but when pin is configure ***1234### then app is can’t open when mmi code is display what happens when app is invisible during this time or how to unistall . For this matter you should reach HoverWatch Support team. Here is the link to the form through which you can contact their support team. I have used hoverwatch for 4 days as trial. Can you please tell me when the transaction will be complete and I can use all of the features ? Could you please tell me on which device you use HoverWatch? Can spy snapchat, whatsapp and messenger to 1 ucet ??? I only have a demo version paid and do not show me messages with whatsapp, messenger, snapchat if I pay to adjust it? I recommend you to contact Hoverwatch support for that issue. I have been sending request to resolve my issue I am not able to see the log , whatsapp chat , sms and locations. When i check the status of the request is in solved state. Could you please expain why i am not able to see hte above mentioned . I have paid for a one month pacakage too thinking it would work. Now nothing is working . If you see that your request has the status solved, you should check your e-mail for letters from HoverWatch support. Does hoverwatch work for Snapchat? I’ve already installed on target phone but it doesn’t show me Snapchat. I’m also still using the trial version, will more features become avalible if I buy the subcription? Yes, HoverWatch can help you with “Snapchat Spying. Please take a look at all the fetures of this app here. If you do not see Snapchat activities, I recommend you to contact their support team here for this issue. Do I have to install anything to the phone I want to watch or only on my phone to view what’s going on the target phone? In order to track someone’s phone, you have to install a cell phone spy app to your target device, which you want to monitor. You do NOT need to install a spyware to your personal phone. You can access your monitoring account from any device you want and see there all the activities on the target phone. Let us know if everything is clear to you. Untill i pay for 1 mounth, he work good, but one day, he tell me the program need update, i was made this update and DOES NOT STILL WORK… not work not work .. please help ! I was send some emails to hoverwatch support team and i don t have reply back ! Please let us know the page adress from which you send your request. So my child has an iPhone will it work on an iPhone? No, HoverWatch works on Android phones and PCs. It does not support iPhone. Please take a look at mSpy software, it has a great variety of spying functions and rather pleasant prices. I am unable to reinstall and I have sent 10 email for support but I am not getting any.. Does it record any app call? like on fb messenger calls? HoverWatch records only simple phone calls, it does record calls, which are made by messengers. However it does track the history and call logs of all messengers, so you can see when and to whom the call was done. I paid one month subscription for nothing, because I couldn’t use it. 1. If the targeted phone has Bitdefender installed, Hoverwatch will not work, as it is seen as a Trojan by the antivirus. To be able to have Hoverwatch installed on the targeted phone using Bitdefender as antivirus, you will need to set up Bitdefender in such a way that will allow Hoverwatch to work, but Bitdefender will always show in the reports that this app is installed on the targeted phone and how it is seen as an app you don’t want to have in your phone, so there is no actual way to hide it from this antivirus. 2. Even before the above antivirus was installed on the targeted phone (Samsung S8+), the phone’s user could see an unknown icon showing from time to time in the notification bar, which led to Bitdefender to be installed and identified and uninstalled the Hoverwatch app. 3. I have made a complain to Hoverwatch on the fact that there were periods of time, for hours, when the targeted phone was used, but all the screenshots made by Hoverwatch were blank. Before Bitdefender being installed. The reply came after two weeks and no actual reason for this issue was provided. The reason I chose Hoverwatch in the first place was because it is a keylogger that takes screenshots for the activity on the targeted phone, which means that gives you access to the targeted phone, without the need to root this. My conclusion is that you can use the app, only as long as the targeted phone doesn’t use Bitdefender as antivirus and as long as you are ok with not receiving all the information at all or on time for some periods of time. Thank you so much for your comment! We are sure that it will be useful to our readers. Caroly, thanks for your comments. Have you tried to reach HoverWatch Support concerning this issue? Sad to say from my experience hoverwatch is not good as advertised, the logs updated well for a week after the installation and it stopped itself. I have contacted the customer support several times and they fixed the log issues three times but everytime the logs stopped cascading after few hours. The customer care have a delay of three days to respond to the messages. Over all I am sad about the money spend for a one year subscription. The same is my problem, it has stopped after a week. Have your app got fixed now ? Do they take calls for technical support and complaints ? I finished trail. And paid they tell me I’m message it’s been processed it’s been hours. Could your please tell me how long it takes to updat the payment.